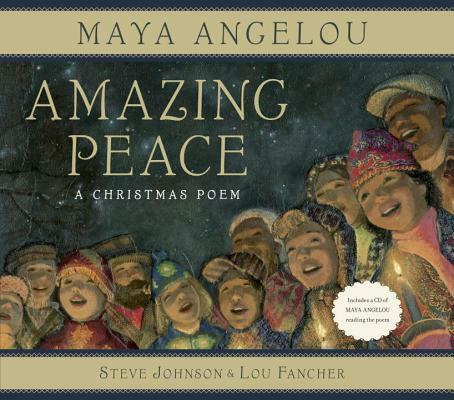 Celebrate Christmas with the joyous poetry of the incomparable Maya Angelou. This special package includes an audio CD of the author reading the poem aloud. Maya Angelou (1928–2014) was one of the most celebrated and distinguished voices of our time. She was an inspiring renaissance woman—poet, writer, performer, teacher, and director. In addition to her bestselling and internationally acclaimed autobiographies, beginning with I Know Why the Caged Bird Sings, she wrote five poetry collections, five books of essays, two cookbooks, and the celebrated poem “On the Pulse of Morning,” which she read at the inauguration of President William Jefferson Clinton. Dr. Angelou was the recipient of three Grammys, the National Medal of Arts, the Presidential Medal of Freedom, and more than fifty honorary degrees. Learn more at mayaangelou.com. Steve Johnson and Lou Fancher have collaborated on many award-winning and New York Times bestselling picture books. Their titles include My Many Colored Days, by Dr. Seuss; New York’s Bravest, by Mary Pope Osborne; The Velveteen Rabbit, by Margery Williams, adapted by Lou Fancher; The Cheese, by Margie Palatini; The Boy on Fairfield Street, by Kathleen Krull; and Star Climbing, by Lou Fancher. School Library Journal has called their work "luminous." You can visit them at johnsonandfancher.com.